For the past dozen years I have had the privilege of collaborating with a group of incredibly smart scientists who have helped shepherd advanced analytics into the human resources profession. Look at where we are now a decade later. There is significant proof that applying analytics and understanding how investments are working significantly improves business outcomes. We now use predictive analytics to help navigate rapidly changing work environments. Big data allows us to capture both structured and unstructured data and turn it into information that enables us to make better-informed decisions. HR is playing catch-up with adopting analytics, as significant research shows. Some of us estimate the HR profession is about where marketing was a decade ago regarding the use of analytics. According to Bersin by Deloitte, only 14% of human resources departments have an analytics function. This compares to 77% of operations departments having an analytics function, 58% in sales, and 56% in marketing. 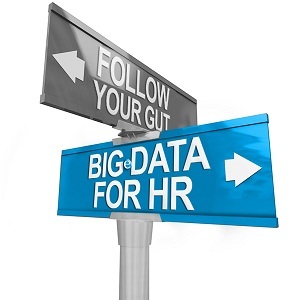 With all the evidence we have on the value of analytics, HR has to do better. I have also had the good fortune to collaborate with thought leaders and write three books on people analytics published by Wiley and the SAS Business Series. In my writing I have tried to present advanced analytical work with a combination of theory, framework and application. Case studies at leading organizations were presented in the first two books. For my last we conducted interviews with leading HR analytics professionals and sprinkled their experienced insights throughout the book and blog. By showcasing them I am hopefully it will help you overcome any obstacles you or your organization may have to join the HR analytics movement. If you do, I promise you won’t regret it. So follow your gut, or follow the data?